Cosequin Double Strength is a daily glucosamine/chondroitin manganese supplement for dogs only. 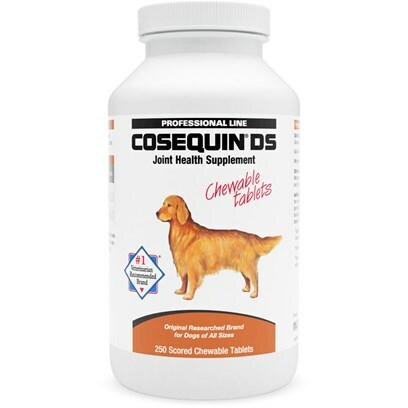 Cosequin DS is intended to treat dogs who suffer from joint problems, such as arthritis and osteoarthritis. It is designed to decrease inflammation, lubricate joints, and support the healthy growth of new cartilage, while protecting the existing cartilage from breaking down. Cosequin DS is a safe and effective approach to joint care, available in roast beef flavor. If you have noticed a big change in your older dog's mobility and eagerness to run and get his favorite toy for a game of fetch, it's more than likely because of flexibility within his joints. Cosequin Double Strength gives you the ability to rejuvenate your dog's quality of life by giving him back his mobility. You'll be chasing after him again in no time.